That's what I've named the bear I just finished knitting for The Mother Bear Project. Not perfect by any means but I'm excited to make more and improve my work! The embroidery was definitely harder than I expected it to be but I will be using more YouTube videos for help next time! Without any more suspense, here's Buster! I've been knitting for close to 20 years (yes i'm only 28 but I learned quick thanks to my amazing Grandma) and before recently all I ever managed to turn out were scarves and small blankets. 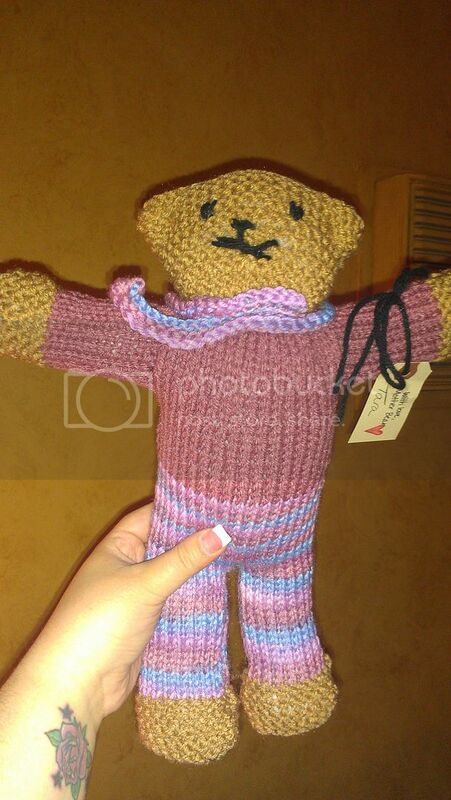 I've been trying to expand my knitting horizons and while doing some surfing on Facebook I came across the Mother Bear Project. MBP is a non profit organization that sends hand knitted and crocheted bears to children in Africa that have been affected by HIV/AIDS. So I decided to do my part to help and I ordered my kit, which came very quickly I might add! In the envelope there was a set of knitting needles, yarn, and a pattern, which even for a scardey cat-I'm-only-sticking-to-scarves knitter like me I found the pattern easy to follow. After another night or two (after I figure out how to sew everything up!) I should be finished and I'll post the finished product here. I can't wait to finish it and start making more bears! As a bonus I'm impressed with myself that I'm making something more involved and it's given me confidence to try new things! So if any knitters out there are looking for a project that goes relatively quickly and is also for a great cause, give the Mother Bear Project a try! I hope everyone who celebrates had a great Easter! We had a great day with our family and I just love having holidays at our new home. I love having everyone together. I didn't take too many pictures but I did get one of the centeripece I did for our table. 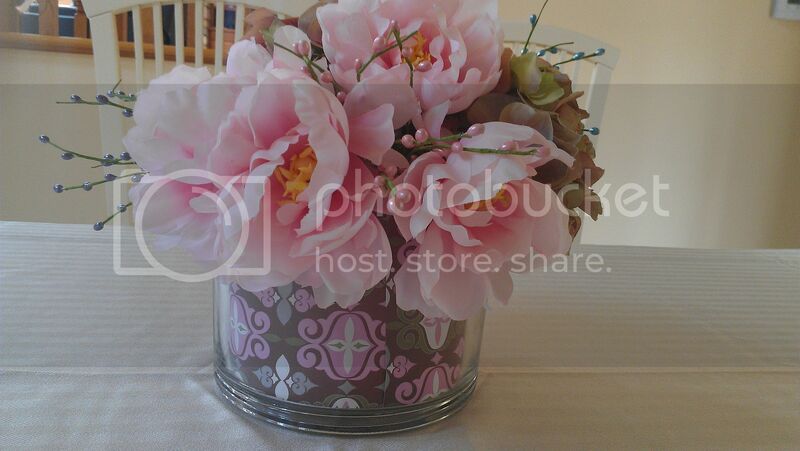 I used peonies, hydrangeas and some stick thinkies from JoAnn's and for the vase I just used an existing vase and put scrap book paper along the inside. 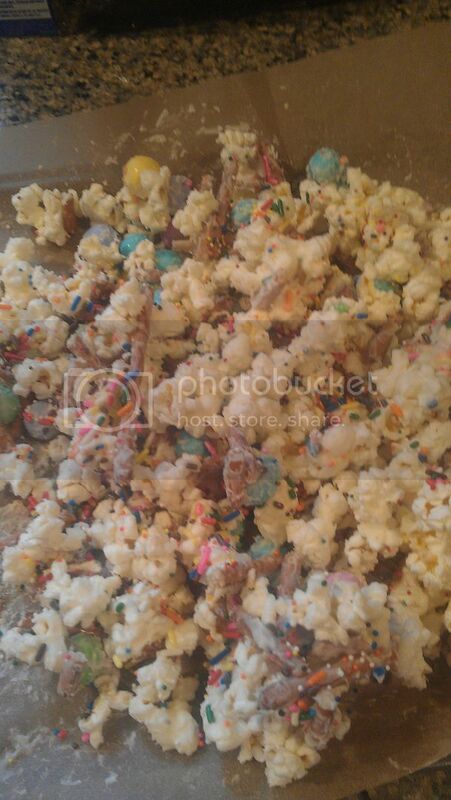 And this is the Bunny Bait. Another recipie inspired by pinterest. After it set up I broke it up and put it into bags for the kids. I have a couple of projects I'm currently working on. One is collecting knit/chrochet hats for my local hospital's maternity unit. If you would like to help please contact me -------> over there.